At CanAm 2011, Executive Director Lee Heighton unveiled the new NAFA Iron Dog Award. A NAFA Iron Dog is a dog that has earned at least one NAFA point in ten consecutive racing years. Iron Dog plaques will be issued annually after the end of each NAFA racing year. For all qualifying Active status dogs (i.e. 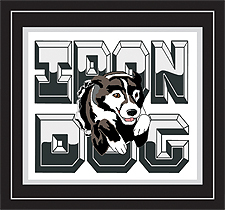 dogs that have earned a point in the last 18 months), they will automatically receive their Iron Dog plaque. For qualifying Inactive/Retired/Deceased dogs, NAFA will be honored to provide a plaque for those special dogs. However, those will be issued only by request via our online form. Iron Dog plaques will be issued annually after the end of each NAFA racing year. Plaques for qualifying active dogs will be mailed to the Regional Directors for distribution. Plaques issued via special request will also be mailed to the Regional Directors unless a request to have the plaque mailed directly to the requestor has been received. Specific mailing preferences will be available on the online form. 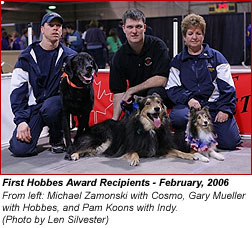 Each time a team races in a NAFA sanctioned flyball tournament with a recorded time under 24 seconds, each dog racing in that heat will receive 25 points toward a flyball title; under 28 seconds each dog racing in that heat will receive 5 points; under 32 seconds each dog racing in that heat will receive 1 point. Title patches for the above titles can be purchased from your local regional contact.